Logging lines are a fascinating railroad subject. Built in areas of large timber and few roads. The twisting trackage and rickety trestles, look unbelievable in the modern age. Often, safety standards in a pre-1950 era appear very minimal. There were many narrow gauge loggers. A pair of ancient classics are found here. A standard gauge logging line too. Steam engines are the exclusive power in this program. 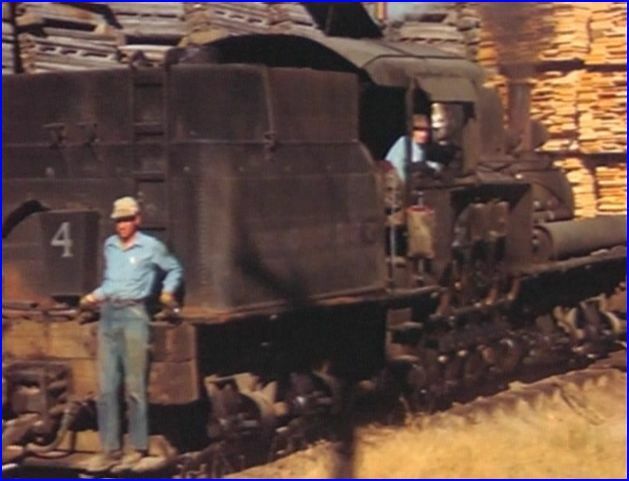 Mainly skeleton flatcars for logs. Some caboose presence. The standard gauge line also has some classic 40′ boxcars interchanged with Southern Pacific. More on this later..
Catenary Video logging shows are presented in a PBS style format. The film is mostly color. Dubbed sound will be in many scenes. Maps are nicely drawn and orient the viewer to the areas and snaking trackage in remote locations.No chapter menu. You can see the previews separately. Adequate narration and some appropriate music, ties it together. Former railroad employees and some others, have some great stories from the old days. Not only the train operations, daily life in a logging camp. Film from 1935 (black &white) is amazing. It shows actual timber cutting, with handsaws and axes! Still photos add to the storytelling. A number of wrecks are seen in the photographs. El Dorado County was loaded with Sugar Pine trees. The vastness of the forest and lack of roads, led to railroad construction. Located north of Sacramento and west of Lake Tahoe. 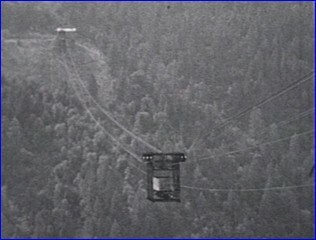 Rugged country required many trestles and even a unique, cable car operation to conquer the woods. Diamond & Caldor has former employees present to reminisce. They have a scrapbook and some stories . This trio adds some real personality, in contrast to the rather dry narrator. D&C appears to be in a very rundown state. Naturally, the dilapidation is attractive to railfans. Those rusty Shays are in, unusually sad looking shape. 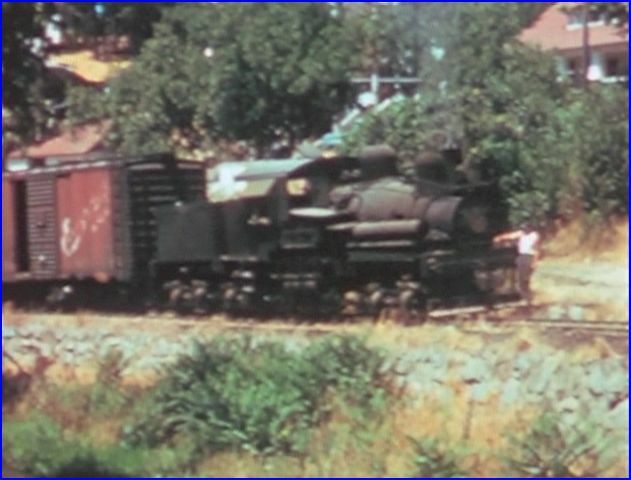 In fact, Southern Pacific refused to run their locomotives on the bad tracks at Diamond Springs. The D&C sure looks appealing in the color footage. Big pines tower over the narrow gauge train, on the sharply curving trackage. 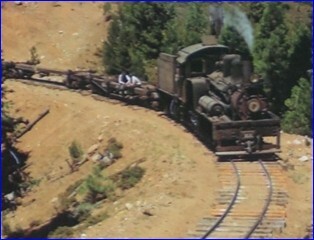 Geared steam engines also had to contend with steep grades. Link and pin couplers were still in use in 1952. This was 50 years after that system was banned. D&C was put on notice to replace the couplers. Hence, the railroads demise. Additional action is shown at the mill. Locomotive mishaps as remembered by those who were there, have surprising revelations. Camino Placerville & Lake Tahoe Railroad is the standard gauge line. This line was 8 miles long! Shays haul the 40′ boxcars. They have a little caboose. Short chapter overall. Michigan- California Lumber is the rare highlight chapter. This has the 1935 loggers filmed at work. A great feature segment, in black & white. The Shays and Heislers are wood burners. Ride on top of a Shay with a string of empty flats. Another engine ride on a loaded train. Pino Grande Mill is visited. 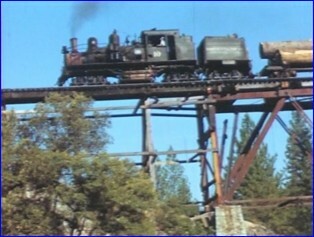 Loaded with milled lumber, the train travels to the American River. There are no tracks for the train to cross the river. Cables will be used. The river gorge spans 2,700 feet. The cables are 1,200 feet above the river. The downward views are dizzying and impressive. The cable tramway is a spectacular operation. Well captured on film in black & white, in 1938. This operation is thoroughly explained. 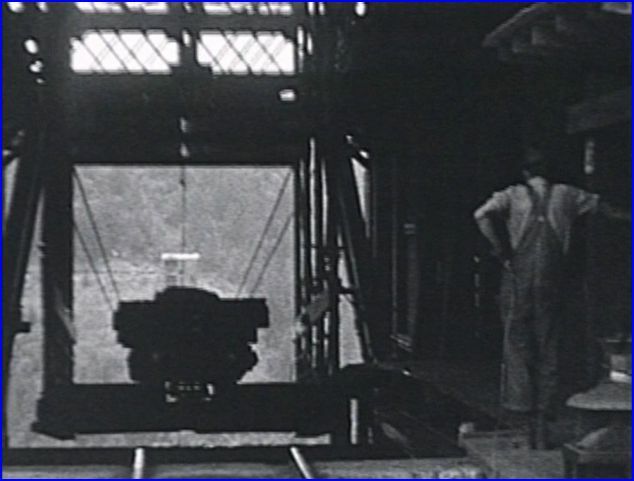 The small flatcars are transported, one at a time on the tramway. Never have seen anything like this! Some color footage is also here. Absolutely amazing to see. The American River cable feature is worth the price of admission. A contemporary segment has restoration of D&C Shay shown, as a work in progress. Digitally remastered films give clear viewing during this show. The audio sounds fine. Many of the short snippets are limitations of the movie cameras from the era. It all plays well and the show is a fun one to watch. Plenty of good history is shared, in a well written script by Don Olsen. The various people interviewed add much to this release. Gives viewers a feel for the region, by the folks that live there. 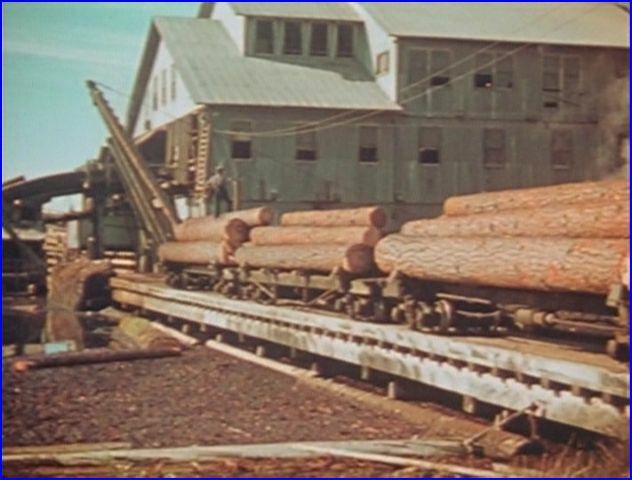 Catenary Video has additional fine logging programs, and some Southern Pacific shows. Many of these will be reviewed here, on ATVR. At 44 minutes, not a long show. It is a memorable logging program. 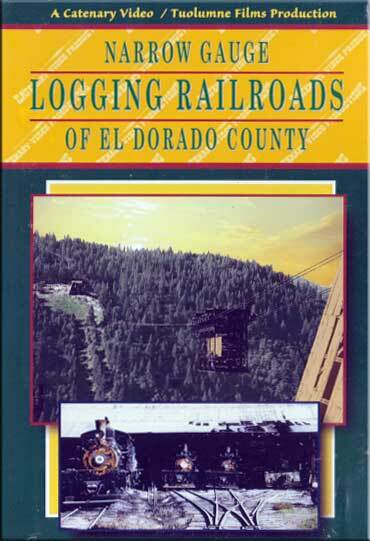 Narrow Gauge Logging Railroads of El Dorado County, is enjoyable! 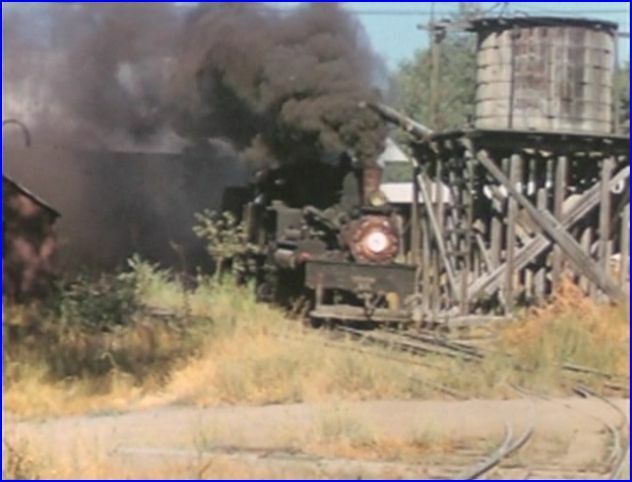 This entry was posted in ATVR Reviews, Catenary Video, Steam Train Reviews and tagged American Train Video Reviews, California, Logging, narrow gauge, new releases, PBS style, Railroad, steam train, Train DVD, train video, train video reviews, transportation by William J. Hudson. Bookmark the permalink.